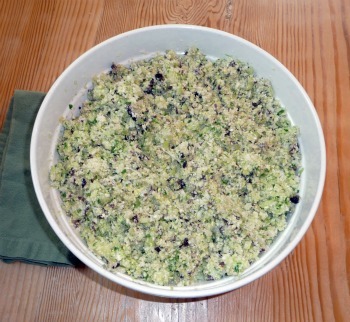 These raw rice recipes are some of my favorite raw recipes of all time. They are my version of a raw recipe I had at Lydia’s raw food restaurant in Fairfax, California where I currently reside. The first time I had it I was swept away with its simplicity, excellent nutritional value, and great taste. I set to work re-creating that wonderful recipe in my own kitchen and have enjoyed it numerous times since I first fell in love with it. Sometimes I eat variations of these for weeks on end as they are so yummy and satiating. They’re so simple to make if you have a decent food processor. The key is to mix some high water content ingredients with some of the ingredients that are not so high in water content so you have a smooth processing experience. As you’ll see from the recipes below finely grated cabbage and cauliflower are the two main ingredients, but after that your imagination is the only limit to what gastronomic pleasures can be created. I use the “S” blade on the food processor and able to get the exact texture I’m looking for. I generally process the cauliflower and cabbage together with ingredients like lemon juice, but process delicate or colorful ingredients like red bell pepper separately and then mix it together in a bowl. This keeps more delicate ingredients from getting processed too finely and allows for the distinct colors of each food to be seen. Although when making the rice for myself I sometimes just throw it all in together and let it fly. Unlike the raw stews and chowders, the raw rice recipes are dryer yet are still moist. One thing I do love about the raw diet is the high moisture content of the foods we eat. Here’s a little trick to keeping the moisture content just right. If you make a rice recipe and it turns out wetter than you like, just add a little seaweed or dehydrated crackers to soak up some of the water content. Because the basic recipe is just off white in appearance any little addition of color really stands out visually and can enhance the overall presentation of the dish. Sweet peppers are great for adding color as well as dulse, radishes, and green herbs. Since this is one of my favorite recipes I would particularly like to have you post your versions of the recipes below so I might try them as well. Check out all the recipes below and try the ones that appeal to you. And please come back to check out new recipes as they’re added and to post your own favorite raw rice recipes so everyone can enjoy them. Do you have a great raw rice recipe? One that make your mouth water just to think about? Share it here so we can all reap the health benefits and savor the goodness that you created!